Tidal Seafloor Pressure sensors measure the force of the seafloor exerted by the weight of the overlying water and atmosphere with a focus on tidal pressure changes by measuring pressure shifts down to the millimeter. 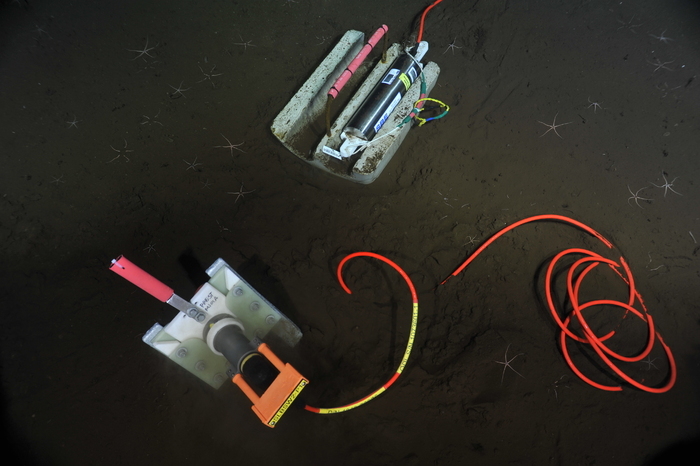 Real-time measurements provided by seafloor pressure sensors are of great importance because lunar tides, storms, and tsunamis strongly impact pressures at the seafloor and the flow of fluids into and out of the oceanic crust. The seafloor pressure sensors are installed and connected to the Cabled Array infrastructure at the Oregon Slope Base Site, at the Axial Base Site, and at the Southern Hydrate Summit site. This instrument measures the following data products. Select a data product's name to learn more. The algorithm code used to generate data products for this instrument is also available in the ion-functions GitHub repository. The OOI includes the following instrument makes and models for this instrument type. Follow the links below to find out where in the OOI this instrument has been deployed. You'll also find quick links for each instrument to Data portal, where you can plot and access data.